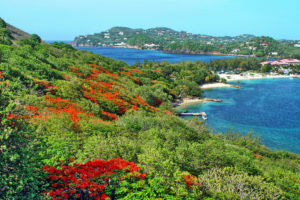 Saint Lucia has long been a destination for tourists in search of a Caribbean getaway, and Rodney Bay is one of the island’s most popular sites. Like many other St. Lucian sites, Rodney Bay got its name from a naval officer. In this case, it was a British naval officer by the name of George Brydes Rodney. He won many battles for the British against the French through the ingenious use of a fort. The fort was built at Pigeon Island, which is at the tip of Rodney Bay, and was used to track the advancements made by the French in Martinique. Today, the fort at Pigeon Island is fully intact and so are the cannons, ready for war at any moment! While Rodney Bay is a beautiful destination, one of the many amazing views from Rodney Bay is across the water. You can clearly see Martinique across the Caribbean Sea when the skies are clear. Rodney Bay has some the island’s most beautiful resorts that are both beachside and inland. If you were looking for a shopping destination, you have come to the right place! Bars, restaurants, banks, and shopping malls fill the bay area. There is a vast selection of eateries that can accommodate those that are looking get a taste of the island to those in search of some comfort food. One of the more popular dining options is to eat street side where you can enjoy the tropical climate while taking in the view of the intricate landscape. Don’t think that this area is just good for its clear waters and photogenic wildlife, Rodney Bay has a nightlife for everyone to enjoy. Enjoy the vibes of the Caribbean and dance all night to the rhythm of some upbeat soca and sway with the wind to the cool reggae vibes. The nightclubs at Rodney Bay are the perfect place to let your hair down after a long day. For all of the gamblers out there, Rodney Bay is home to the island’s only casino which is located in the Baywalk Shopping Mall. When booking your next trip to Saint Lucia, make sure that you book Dave Charles Taxi & Tours to provide you with a one-of-a-kind view of Rodney Bay! We can provide you transportation to and from whatever destinations you choose to visit and also guide to some of the island’s greatest treasures. Give us a call today at (758) 715-4573.